Arthritis - joint inflammation - is very common, and typically causes pain and stiffness in the affected joints. a joint with rheumatoid arthritis. A joint is a place where bones meet. The muscles surrounding a joint make the bones move by contracting and relaxing. The muscle is joined to the bone by a fibrous cord known as a tendon. The ends of most bones have a layer of cartilage covering them. The cartilage is smooth and slippery and forms a cushion that absorbs shock and also prevents bones from rubbing against each other. The joint is surrounded by a membrane called the synovium or synovial membrane. This produces a thick fluid called synovial fluid that protects and lubricates the joint. The synovium is enclosed by the capsule which holds the joint together with its fibrous bands called ligaments. Osteoarthritis (OA) is the most common type of arthritis. Often associated with ageing, the exact cause of osteoarthritis is not known. However, factors that are known to increase your risk of OA include a family history of osteoarthritis, excessive wear on joints, and injury. You may have several joints affected by OA, just a few or only one osteoarthritic joint. What happens to joints in osteoarthritis? When you have osteoarthritis, it affects the entire joint, including the bones, cartilage, joint capsule, synovial membrane, synovial fluid, tendons, ligaments and muscles. Osteoarthritis involves the breakdown of the protective cushion of cartilage surrounding the ends of the bones where 2 bones meet to form a joint. A healthy joint has a lining of smooth cartilage and is lubricated by synovial fluid. In osteoarthritis, the cartilage becomes flaky and rough and small pieces break off to form loose bodies in the synovial fluid. This causes irritation and inflammation of the synovial membrane. The loss of cartilage leaves bones unprotected and vulnerable to damage. As the roughened cartilage becomes thinner, the bone underneath thickens and swells. The smooth functioning of the joint is lost and the bone can lose shape and bony spurs (osteophytes) may form on the bone end. Microfractures may also occur in the ends of the bones. The joint capsule and ligaments stretch, and may thicken slowly to try to stabilise the joint as it changes shape. The tissue around the joint can also become inflamed. OA can also result in deterioration and weakness of the tendons, ligaments and muscles around the joint. Which joints are affected by osteoarthritis? Rheumatoid arthritis is an autoimmune disease, meaning that your immune system attacks the tissues in the joints, resulting in inflammation. The exact cause of rheumatoid arthritis is not known, but it is thought that genetic factors may be involved, and that infection may trigger the development of RA in some people. What happens to joints affected by rheumatoid arthritis? Rheumatoid arthritis (RA) results in inflammation of the joints and, in particular, the synovial membrane that covers them (synovitis). 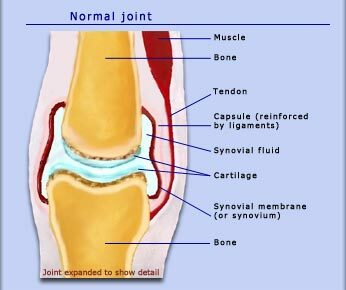 An overproduction of synovial fluid occurs, which causes joints to swell and the capsule to stretch, causing pain. The inflammation in the joints causes damage to the cartilage and sometimes to the bone ends. If this process is not halted, the cartilage damage can result in deformities or destruction of the joint. The tendons may also be inflamed and worn down. This is why taking medicines to suppress inflammation early on in the course of the disease is very important in RA. 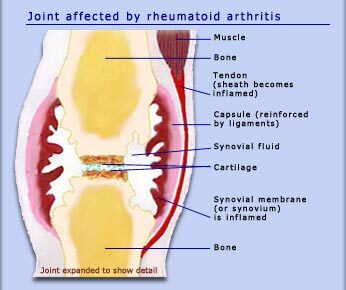 Which joints are affected by rheumatoid arthritis? The elbows, hips and the spinal joints in the neck are less commonly affected. 1. Osteoarthritis (published Mar 2017). In: eTG complete. Melbourne: Therapeutic Guidelines Limited; 2017 Mar. http://online.tg.org.au/complete/ (accessed Jun 2017). 2. Rheumatoid arthritis (published Mar 2017). In: eTG complete. Melbourne: Therapeutic Guidelines Limited; 2017 Mar. http://online.tg.org.au/complete/ (accessed Jun 2017). 3. Arthritis Australia. Osteoarthritis (reviewed May 2015). http://www.arthritisaustralia.com.au/images/stories/documents/info_sheets/2015/Condition%20specific/Osteoarthritis.pdf (reviewed Jun 2017). 4. Arthritis Australia. Rheumatoid arthritis (updated May 2015). http://www.arthritisaustralia.com.au/images/stories/documents/info_sheets/2015/Condition%20specific/Rheumatoidarthritis.pdf (accessed Jun 2017). 5. BMJ Best Practice. 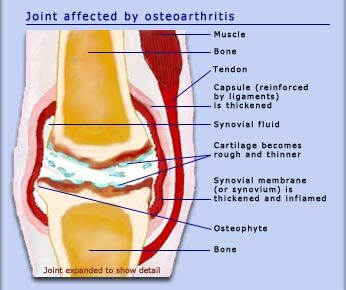 Osteoarthritis (updated 23 May 2017). http://bestpractice.bmj.com/info/ (accessed Jun 2017). 6. BMJ Best Practice. Rheumatoid arthritis (updated 24 Apr 2017). http://bestpractice.bmj.com/info/ (accessed Jun 2017).